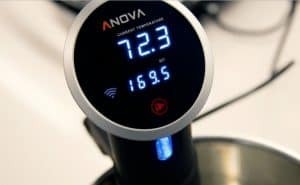 The Anova WiFi Sous Vide Precision Cooker is a well designed high quality model, however it's a little pricey compared to similarly equipped models on the market mostly because of it's WiFi Connectivity. Lower power than other models. $153.33 Current Price - YOU SAVE $22.71. The Anova Wifi Sous Vide Precision Cooker is the upgraded model from Anova. This model is slightly more powerful than the Anova Bluetooth Sous Vide and comes with the more flexible WiFi connectivity. These upgrades do come at a steep price upgrade of about $25 more than the previous model. This model is just under 15" tall and under 3" in diameter, although the clamp will add almost 4" to one side. The top of the unit is a high impact polycarbonate plastic that's very solid. The tube is an extremely high-quality stainless steel sleeve that can be removed for cleaning. The Anova sous vide machines all get very high marks when looking at build quality. 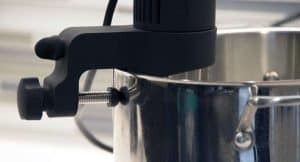 The clamp design on the Anova sous vide cookers is the favorite of all the models we reviewed. It's a detachable ring with a set screw that you attach to the side of your cooking vessel. It allows you clamp it to virtually anything, and you can control the distance between the unit and the sidewall. More importantly, when you put the tube with the cooking element through the ring you can adjust the height, this makes things a lot easier to work with. This unit is rated at 900 watts, which is on the lower end of all the units we reviewed, but it is 100 watts more powerful than the Bluetooth model. The maximum temperature is 210°F although most people won't use a setting anywhere near that high. The minimum water level is 2.75" and the max water level is 6.25" which is a nice good range. It can heat a maximum of 5 gallons of water. The flow rate is 1.2 GPM which is on the lower end of the models that we compared, so it will take slightly longer to cook your food, but you will have less evaporation, so itâs a bit of a trade off. This model was slightly noisier than the other models, but it shouldn't be a problem for most people. The readout for this model is a large easy to read LED face that's on an angle. The larger temperature shows the actual temperature of the cooking liquid, the smaller readout shows the target temperature. You change the set temperature with a scroll wheel on the side of the tube. This model allows you to connect via WiFi instead of Bluetooth. The advantage is WiFi has a much greater range and because it's connected to the internet, this is an Internet of Things Appliance. The precision cooker is controlled via an app on your phone that's available for both Android and iPhone. Theoretically, you could be sitting in your office and connect to the device at home and tell it to start cooking. However, to do that you would need to leave the food sitting at room temperature all day, which goes against every food safety recommendation we've ever read. This model does come with a timer, however, setting it on the actual unit is clunky and frustrating, you're much better off using the app. The Anova WiFi Sous Vide keeps everything we loved about the Bluetooth model, and increased the power and upgraded the connectivity. These upgrades, however, have a steep price jump of about $25 over the previous model and we're not sure it's worth it. The tow other WiFi Sous vide models we looked at were the ChefSteps Joule Sous Vide and the Nomiku WiFi Sous Vide which were both more expensive than this model. 14.8" x 2.8" x 2.8" 14.8" x 2.8" x 2.8" 11" x 1.9" x 1.9"
The Anova WiFi Sous Vide Precision Cooker is one of our top rated models that has all of the features you want in a sous vide cooker plus internet connectivity, and Alexa Compatibility.